We may not need to go far to find extra-terrestrial life after all. The motivation for the quest for exoplanets, or planets that orbit distant suns, is to find one that has the conditions to support life. The conditions that we look for in such planets are mainly the presence of water and a temperature range where there could be life as we understand it. Even if we did find such a planet, however, it may not be of practical value for some time, as the distances are in multiples of light years. A report in the journal, Nature Astronomy, suggests that we may still find signs of extra-terrestrial life much closer home, on Europa, one of the moons of Jupiter. However, as the surface of Europa, a likely host for life forms, is battered by intense radiation, it has been feared that any signs of life may not survive till deep below the surface. TA Nordheim, P Hand and C Paranicas, from the California Institute of Technology and Johns Hopkins University, describe a study that suggests that life forms could be there at a depth of just a centimetre. Europa is one of the four moons of Jupiter that Galileo discovered in 1610 when he used a telescope for the first time. Europa is a little smaller in size than our own moon, has practically no atmosphere and the temperature is more than 160°C below freezing. As the surface shows high reflectivity, it is believed that it is covered with ice. Observations by the Hubble Space Telescope in 2012, and again in 2014 and 2016, have detected what appear to be plumes of water emerging from different parts of the moon. This indicates that there is a large body of liquid water below the ice and the plumes are possibly the result of volcanic activity. There is evidence, in fact, that there may be more water on Europa than all the water in the Earth’s oceans. While volcanic activity may be a source of heat to keep the water liquid, it is also considered that tidal forces, because of the gravity of Jupiter and the other three moons, also creates pressures within the mass of Europa. These would have the effect of warming the water body to keep the volume below the outer crest in the liquid state. This tidal activity may also be raising matter from the bottom of the ocean to the surface. Surface features that have been observed from orbiting missions also suggest that there is matter welling up. These conditions — apparently warmer temperatures and the rich chemical makeup below the surface — constitute a medium in which life forms could flourish. 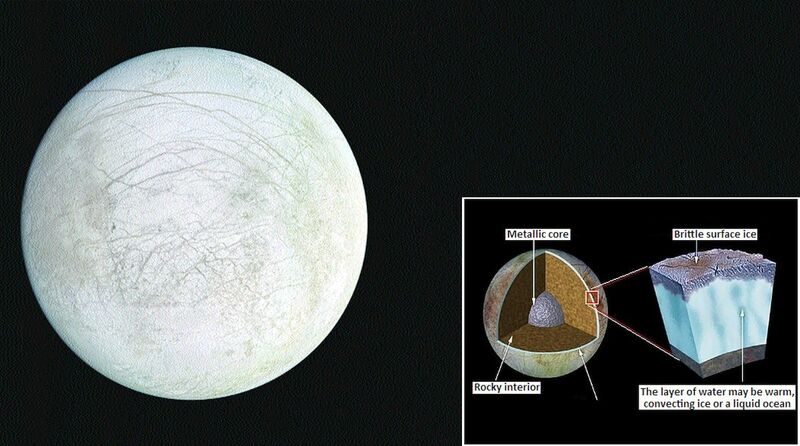 Europa has hence been considered a prime candidate to be host of extra-terrestrial life. The space missions sent out to Europa have all had the detection of signs of life as part of their objectives. While it was thought that the plumes of water could bring with them living things or their constituents from deep within the moon, it has been understood that nothing would be able to survive on the surface because of the onslaught of radiation. This blast of radiation is a result of a gale of charged particles that whips around the mother planet. Jupiter’s magnetic field is 14 times stronger than Earth’s and the planet has a rotation period of nine hours. The strong and rapidly changing magnetic field reacts with the charged particles, mainly electrons, protons and alpha particles that stream forth from the sun, the solar wind. These, along with the rich outpouring of charged particles from Io, Jupiter’s volcanic moon, create the planet’s rotating torus of charged particles. This region, which is called the magnetosphere of Jupiter, extends seven million kilometres towards the sun and another seven million kilometres, almost to the orbit of Saturn, in the opposite direction. This is the largest magnetosphere in the Solar System and its existence was first inferred from strong radio signals that come from Jupiter, as a rotating radio beacon. The result is that the moons of Jupiter (there are 79 in all, including the large four discovered by Galileo) are blasted with radiation. In fact, even spacecraft that were sent near Jupiter and to fly past Europa needed special shielding and could remain in the radiation only for short periods. The effect of this radiation would be so scorching on the surface of Europa that it was believed that no living thing, or even amino acids, as evidence of proteins, could last long enough to be detected. It was believed that if ever a lander craft were sent to the surface of Europa, it would need to dig several metres before it could hope to collect a sample that contained signs of life, if there was any. This apprehension has relaxed with the findings of the Caltech and John Hopkins researchers. What they found was that Europa’s own magnetic field shepherds the radiation, fortunately for life forms near the surface, and does not allow it to be equally strong at all latitudes. It is similar to the effect of the Earth’s magnetic field that keeps it safe from the solar wind. The stream of charged particles striking the Earth gets deflected by the magnetic field and it forms a region called Van Allen’s Belt around our planet. The paper in Nature Astronomy says that modelling the way the charged barrage would deflect in Europa’s magnetic field shows that radiation would be strong near the equator and at the poles, but considerably weaker at high latitudes. Simultaneous laboratory trials with radiation and its effect on amino acids have indicated that in a selected latitude belt on Europa, amino acids would be able to survive at a depth of just a centimetre below the surface. At other places, this depth could go to tens of centimetres or more. This is good news, as NASA is in the process of readying a craft to land on Europa. The launch is planned for 2024 and the landing for 2031. Including equipment to dig deep into the surface would almost certainly not be possible. But now it appears that samples where there are signs of life, if there is any, could be collected at shallow depths, which would be within the lander’s capability.